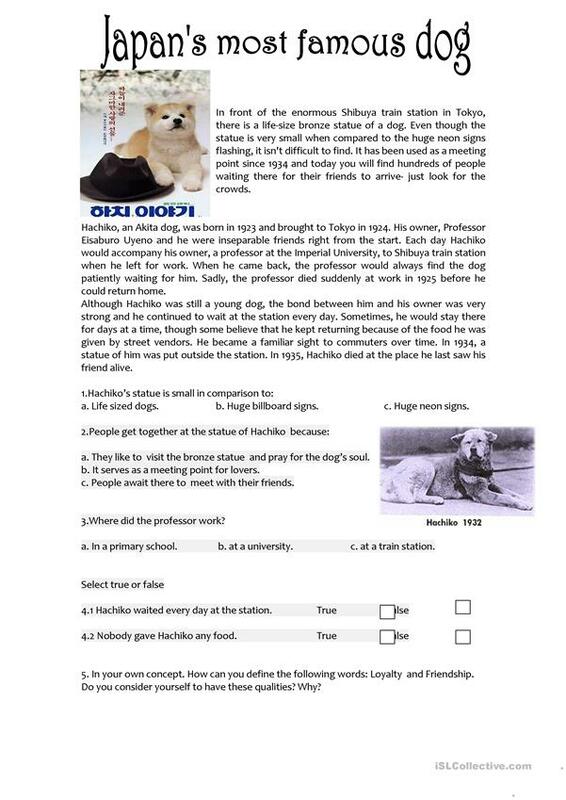 Reading comprehension activity based on the most famous dog from Japan "Hachiko". This activity includes the use of past simple and passive voice. The present downloadable teaching material is recommended for high school students, elementary school students and adults at Elementary (A1) and Pre-intermediate (A2) level. It is aimed at revising Past simple tense in English, and is useful for developing your students' Reading and Writing skills. It features the topic and words of Celebrities (stars, famous people). Kameza is from/lives in Colombia and has been a member of iSLCollective since 2012-08-01 02:29:37. Kameza last logged in on 2019-04-12 16:10:26, and has shared 41 resources on iSLCollective so far.